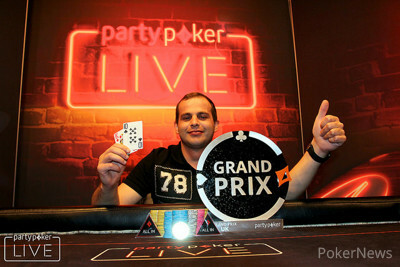 Robertas Gordonas Wins Grand Prix UK Main Event for £150,000! 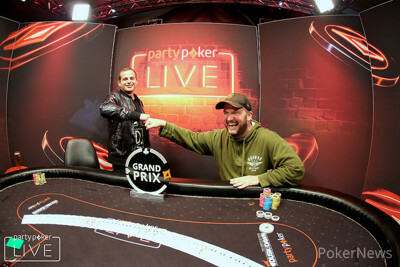 Robertas Gordonas lifts the fabled Grand Prix Main Event trophy. 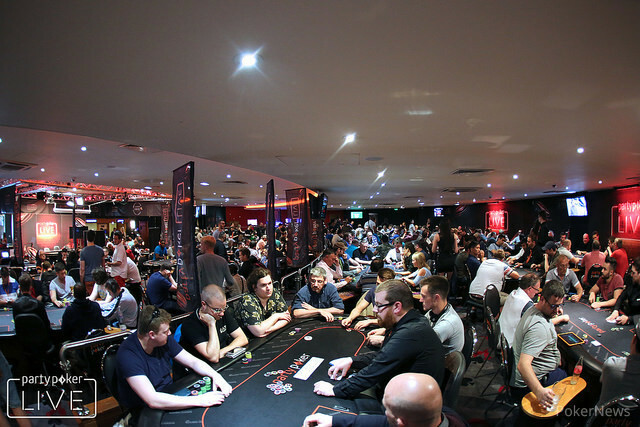 We started the Grand Prix UK with 5,143 runners (clearing the massive £1,000,000 guarantee by a generous £28,600) across a plethora of Day 1's, both online on partypoker and live at Dusk Till Dawn, through a number of Day 2's, until the field was whittled down to just 53 players coming back for Day 3 of the Main Event at high noon. When it was all over, Robertas Gordonas was the victor, beating Richard King heads-up to take the £150,000 top prize and the Grand Prix UK Main Event trophy. The field broke down quickly, with some household names failing to convert their deep run, although 50 players did manage to secure themselves a £2,200 UKPC seat. Three tables out was when we really started to see who would make a legitimate shot at the title of Grand Prix UK champion, with some huge stacks giving us a masterclass on how to close a poker tournament. Each of our eight finalists were as good as the next, each equally deserving of the trophy, but it would be the man who took the chiplead into the final table, Robertas Gordonas from Lithuania, who would ultimately take it down. He took control of the table early on, after some of the short-stacks disappeared, had over half of the chips in play with four players left. Going into the heads up battle against Richard King, Gordonas had a resounding chiplead and it was his tournament to lose and he maintained his composure to see it out for the win. Robertas Gordonas will take home the massive £150,000 first prize, for a £200 + £20 tournament and lifted the prestigious Grand Prix UK Main Event trophy. We spoke to Robertas and Richard after the dust settled. Congratulations Robertas from all of the team and a massive thank you to everyone who contributed, from the commentary team of Jesse May and Simon Trumper, all the staff at Dusk Till Dawn and of course the players, but most of all everyone who read along with the updates and joined in by chatting to the commentators as such a high quality final table played out. "He fully deserved the win, he was the best player on the day," Richard King said of his opponent as the two men congratulated each other on a fine heads-up battle in the moments after the tournament ended. On that note, we look forward to seeing you at the next partypoker event where another major title and stunning top prize is bound to won in dramatic circumstances! Both Richard King and Robertas Gordonas have tickets to the Caribbean Poker Party and the UK PC Main Event, so we may very well see them renew rivalry later this year. From Nottingham's Dusk Till Dawn Casino and the Grand Prix UK Main Event, good night, good morning, but most importantly good luck! Robertas Gordonas raised the button to 7,500,000, with Richard King immediately coming over the top for his entire 26,000,000 stack. Gordonas wasted no time in making the call, and the cards were on their backs. The flop bricked both players hard, Gordonas' king high still way out in front. The on the turn meant that it was all over. 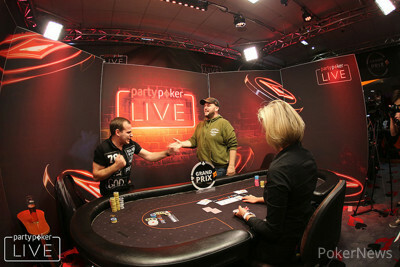 Richard King takes home £100,000 and a £2,200 UKPC seat. Jamie Whyte may have busted in third place, but the amiable Scot told us that he was more than happy with his result in the Grand Prix UK Main Event, which saw him collect £70,750 and a seat to the UKPC Main Event worth £2,200. "I'm exhausted!," Whyte told us in the immediate aftermath of his bust-out hand to poker pal Richard King. "I busted Day 2 at 3pm yesterday and was being driven back to Scotland by my friend. I live five hours away and played the $2.20 satellite to pass some time. I made the Day flight, then the Day 2 flight. I made it through to Day 3 at 2.00am. I got home, booked a flight back and flew at 6am into Birmingham, got a cab here and played Day 3. I need some sleep." Whyte's spin-up story from a $2.20 satellite to £70,750 being in his bank account 36 hours later may sound miraculous, but he's not green. Whyte has some impressive online results, and in 2016, cashed in the $10,000 WSOP Main Event. This still represents his biggest live win. "I came back with 15 big blinds, but already had £2,500 locked up, so that made the flight costing £200 well worth it, and it worked out really well, it's a great score, I'm really happy. I met Richard [King] when he came 12th in another million-pound guaranteed tournament here a couple of years ago. He's a really nice guy and the hand at the and was fine. I'm obviously gutted he has A-Q in that spot, but I've talked it through a little with my backers and it's fine. I have a decent percentage of myself and it's a really good amount, especially with how tough online has got in recent years." Jamie is coached by two players right now, one from the high-stakes and another from mid-stakes. He told us that the blend of knowledge is something he loves to learn from. "They're great and it's fun. I love the strategic side of the game, I don't really focus on results, just making better decisions and dealing with things well. I'm 28 now...when I was 23 I would have reacted way more emotionally. " Unlike many of his peers, Whyte is not heading to Las Vegas to take on the Main Event this year. The reason is a good one. In fact, you might say it's the best one. "I have a really good friend who's getting married while the Main Event is going on. I've not done any best man speech preparation yet, but that's what I'm supposed to be doing! The funny thing is that his wife's booked their honeymoon for Vegas on the final day of the World Series. So we all miss the Main to be at the wedding and they flight out to it as husband and wife on final day." We Are Now Heads Up! We are down to our final two, Richard King and Robertas Gordonas, playing for the Grand Prix UK trophy, and the £150,000 first prize! Jamie Whyte was down to his last 33,000,000 chips and called Richard King's blind-on-blind shove, after Robertas Gordonas folded his button. Whyte smirked as he tabled his , which needed some help versus King's . There were some backdoor sweats on the flop, but the on the turn wasn't one of them. Whyte needed a 10 and only a 10 to stay alive, but the river would come the and King dragged the pot. Jamie Whyte collects £70,750 in cash and has been credited with a £2,200 UKPC seat. 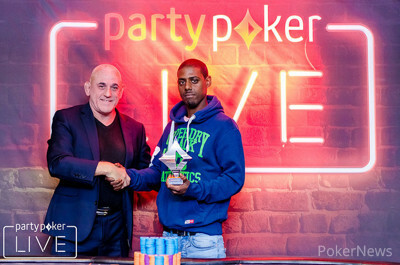 Leon Campbell Wins £50,000 Guaranteed Side Event for £11,000! After a gruelling two days, London-based Leon Campbell has taken down the £50,000 Side Event, winning £11,00 and the trophy (pictured). 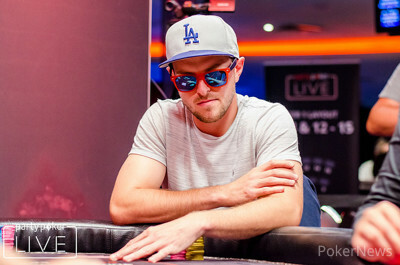 With seven player players left, Campbell dodged a bullet in a massive pot where he managed to get away from quads on the river to preserve a strong stack. That key protection of his presence at the felt led to more chances and he ran out a comfortable winner when he went into heads-up with a commanding lead. "I was 3:1 going into heads-up. The other guy wanted a deal, but c'mon you know me. 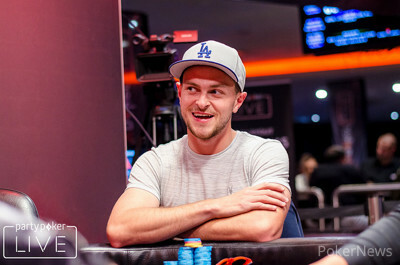 It would have to be Sam Trickett opposite me for me to do a deal when I'm that far ahead heads-up!" Robertas Gordonas raised to 4,200,000 on the button, with Richard King calling from the small blind, and Jamie Whyte coming along from the big. All three players took a flop, with action checking around to Gordonas who continued for 9,200,000. Richard King thought for a while before making the call, with Whyte ducking out of the way. The rolled off on the turn, with both King and Gordonas checking. The paired the board, which King led for 13,000,000. Gordonas quickly reached for his chips to call, but then proceeded to study for a minute or so before dumping 13 golden million-value chips over the line. King whipped over the , but was no good versus the of Gordonas, who dragged in a huge pot. Who's your favourite 80's tribute act?